Articulate Storyline 2 makes it simple to create drag-and-drop interactions. All you need is an item that can be dragged and a place to drop it (called the target). In this tutorial, you'll learn two easy ways to create a drag-and-drop interaction—either using triggers or using the convert-to-freeform feature, which includes built-in quizzing functionality. Let's start by building a drag-and-drop interaction using triggers. Later, we'll build one using the convert-to-freeform feature. Download the practice files here. Watch this video, then follow the steps below to practice. For this drag-and-drop interaction, we want the refrigerator to open when the ice cream is dragged over it and close when the ice cream is dragged away. Open the 03F_Drag_Drop_Interactions.story file from the practice files and go to slide 1.3 Practice. To start, our slide has two images: the ice cream and the refrigerator. If you select the refrigerator image, you'll notice that it has two states: the normal (or closed) state and an open state. Add a trigger that changes the state of the fridge to open when the ice cream is dragged over it. Preview the slide. Notice that the fridge opens when the ice cream is dragged over it, but it doesn't close when the ice cream is dragged away. To make the fridge close, we need another trigger that changes the fridge to the normal/closed state when we drag the ice cream any place other than over the fridge. We'll use a hotspot to make this work. Insert a rectangular hotspot that covers the entire slide. On the timeline, drag the Hotspot 1 object down to just above the bottom bar rectangle. This reorders the hotspot to sit behind most of the other slide elements. We'll follow good practices and rename Hotspot 1 to closed target on the timeline. 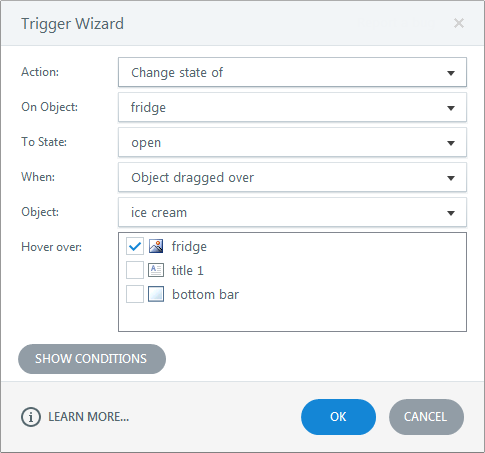 Create a new trigger that changes the state of the fridge to normal when the ice cream is dragged over the closed target hotspot. Preview the slide to see how everything looks. The last step for this example is to make the fridge door close and the ice cream disappear when it's dropped on the fridge. 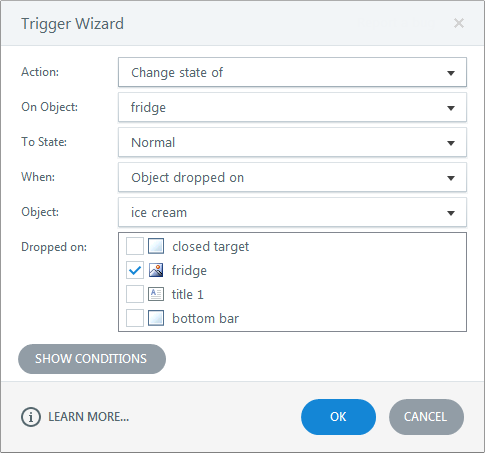 Create a new trigger that changes the state of the fridge to normal when the ice cream is dropped on it. Add a new Drop Correct state for the ice cream. While you're editing the states, delete the ice cream image from the Drop Correct state so it's empty. Preview the slide to see how everything works. Now, let's build a quick drag-and-drop activity using the convert-to-freeform method. Watch this video, then follow the steps below to practice. Go to slide 1.4 Practice. Just as before, this slide contains some objects. There are four items and a box. You’ll also notice that there are no slide layers. We're going to convert this slide to a freeform question. Go to the Insert tab on the ribbon, click Convert to Freeform, then choose Drag and Drop. This opens a form where you can choose your Drag Items and Drop Targets. The form also contains all the default programming required to grade the interaction and provide feedback. As you'll see, there are a few options. For now, we’ll just go with the default settings. Under the Drag Items column, select the flashlight, hotdogs, radio, and water images to make them all draggable. 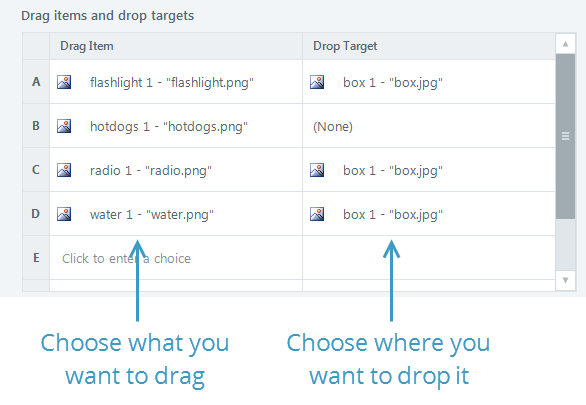 Under the Drop Target column, select the box image for everything except the hotdogs, which is incorrect and therefore doesn't have a target. We’ll keep all the default settings. This process will convert the slide objects into a drag-and-drop interaction that can be graded. Now click the Slide View button and look at the slide layers. You’ll notice that Storyline created the Incorrect and Correct feedback layers for you. These can be edited just like other layers. To work on the visual design, click the Slide View button in the top right corner. When you want to edit the interaction, click the Form View button. As you can see, you can convert anything you put on a slide into a drag-and-drop interaction in minutes. If you get stuck, feel free to ask someone in the community or check out some of the other Storyline tutorials. In the next tutorial, you'll get an introduction to variables.